If you recently received delivery for an Apple Watch, you may soon receive – or perhaps already received – an email from Apple. In a series of surveys designed to get feedbacks about the Apple Watch, Apple is contacting Apple Watch owners and asking them to complete a simple survey. The survey is, quite frankly, a lengthy one. 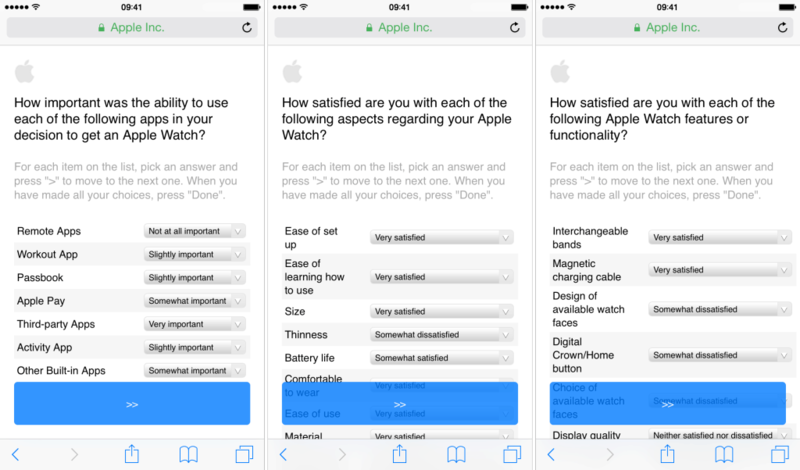 It has a lot of questions and covers a wide range of subjects about users’ experiences with their Apple Watch. Prepare to spend around 15 to 20 minutes completing the survey once you get started. This type of survey is really against Apple’s habit of simply not relying on market research at all. In fact, in an interview with Fortune in 2008, Steve Jobs clearly stated the company’s policy against this type of market research. “We do no market research. We don’t hire consultants. We just want to make great products,” Jobs then said to the reporter. The survey, being so elaborate and comprehensive, is also more than just an attempt to see how the Apple Watch is doing in the hands of customers. It is a clear move to get insights from customers directly; this is certainly a great move to make if Apple is serious about making a much better smartwatch in the future. On top of this email blast and the elaborate survey that comes with it, Apple is also asking customer support officers to ask users about their Apple Watch when they phone in. This means those of you who are calling in to get an Apple Care coverage for the smartwatch will also be asked a number of questions. Unfortunately, both the online survey and the questions asked over the phone are not as pleasant as we would like to think. Customers are beginning to complain about being asked so many questions and find them to be more of an annoyance than of a way of getting customer insight. The fact that Apple is launching a customer survey with its Apple Watch sales never officially announced makes many wonder if the company is really confident about its smartwatch. Apple has indeed never released the official sales figure for the Apple Watch, and has always resorted to vague answers and comments when asked about the matter. Even so, experts and analysts are estimating a total sales of over 2 million Apple Watch units even with the production issues and other problems still looming around. Based on everything that has been outlined so far, what do you personally think about Apple’s efforts to ensure that everyone is happy with the Apple Watch? Let us know your thoughts in the comment section below.